Five ways to use $2.2 Million Dollars productively. 1) Buy a 2013 Bugatti Veyron 16.4 Grand Sport Vitesse. Cost: $2,250,000 (ok, you’ll have to kick in another $50K..). Pro: 255 mph on the ground if you own a two mile runway to drive it on. Con: EVENTUALLY you’ll see another one in the Costco parking lot. 2) Charter the 36-ft. ‘Eclipse’, the world’s largest private yacht for one week; sail from the Mediterranean to the Seychelles. Cost: $2.M USD. 3) Buy an original Picasso Drawing. Actual Recent Sale: $2M. Con: Oops, it’s a fake! 4) Send four bright advanced math students to the best business schools in the nation so they can get great jobs crunching algorithms for Wall Street Investment bankers. Actual Cost: about $500,000. Cost to society: about $500 Billion. Con: Been there, done that! 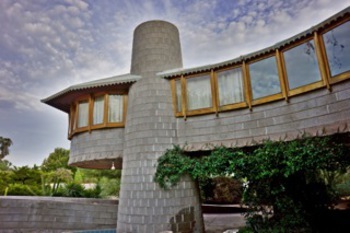 5) Buy the David and Gladys Wright House. Pro: You’ll save one of the best homes by the greatest architect of our time and the only one in the World from being smashed into bits. BONUS: You’ll reduce the carbon footprint of the World by NOT allowing two huge Mansionettes to take it’s place. This will allow next spring to greatly influence millions of butterflies that will stir up air currents making the Ice Caps melt more slowly which in turn will save hundreds of polar bears and ultimately prolong the entire existence of life as we know it…. Con: You’ll be heralded as a hero (wait, that’s a bad thing? ).